These delicious Oreo® Cookies are a sweet token for those of all ages! 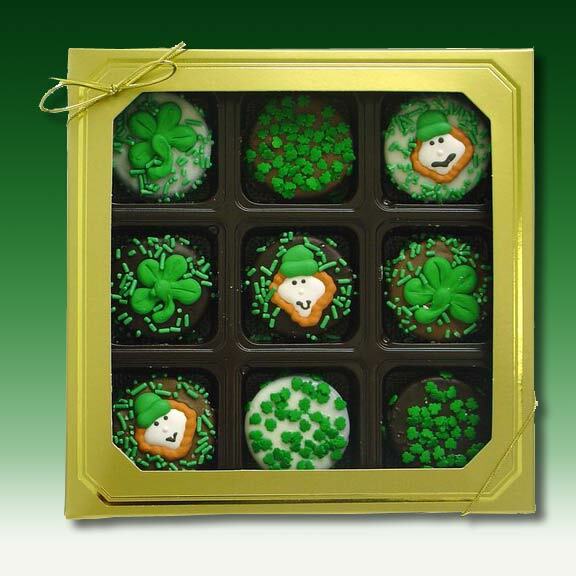 Wrapped in an assortment of decadently delicious fine gourmet Belgian Chocolates--Dark, Milk or White--and decorated with hand-crafted Royal Icing Leprechauns and Shamrocks and assorted Saint Patrick's Day Candy Sprinkles. Presented in our Gold Window Box of 9 Cookies and finished with a gold stretch loop ribbon, these cookies are a great Saint Patrick's Day Gift!